This ovoid-shaped lamp, decorated with a frog, Like vine fronds, frogs symbolized rebirth and resurrection, hence their use on Christian lamps. This is a regional style lamp exclusively produced in Egypt and found in the regions around it, between ca. 100 – 300 CE. The frog is an Egyptian fertility symbol. The frog, a symbol of rebirth, appeared in amulet form as early as the Predynastic Period. During the Dynastic Period it was identified with Heket, goddess of birth and fertility: the hieroglyph "frog" formed part of this goddess's name. Associated with the god Khnum, Heket was worshipped in the city of Antinoe, close to Hermopolis. In funerary iconography, the vine branch or foliated scroll was an image of rebirth. For this reason, frogs and vine fronds appeared on Christian lamps with the "ankh" sign (signifying "life"), and sometimes the inscription "ego eimi anastasis formula," "I am the resurrection." 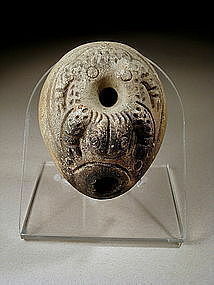 A fertility symbol is an object used by early historical human societies representing fertility. These symbols took on several different forms. For example, some fertility symbols took on the appearance of a rotund human female as obesity was seen as attractive in times when food was scarce. Also, certain animals that reproduce often have been viewed as fertility symbols, such as frogs and rabbits. An oil lamp is a simple vessel used to produce light continuously for a period of time from a fuel source. The use of oil lamps extends from prehistory to the present day. This was a basic form of lighting widely used prior to the era of electric light. Oil lamps are however still used today for mood lighting, as an alternative to candles, or as an alternate source of emergency lighting when electricity is not available.